New York-based graf writer Wane was invited to paint during the City of Gold Festival in 2014. 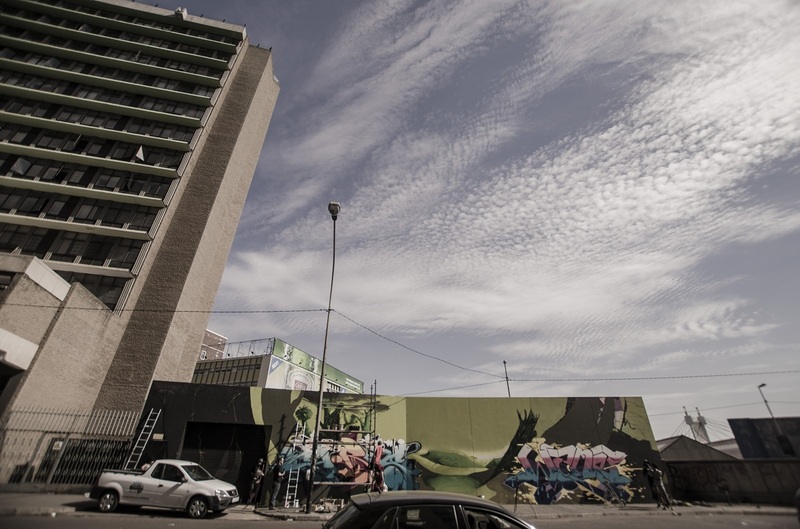 Writer and journalist Neo Maditla spoke to the legendary pressure controller about his life-long passion for gaseous fumes, and about why innercity Jozi’s similar to the New York of old. We met on a particularly hot day in Joburg, in 2014, his third day in the city at the time, so he was still finding his bearings and hadn’t seen much. Wane was painting on a busy street where there was a union protest in the street – something to do with labour brokers; there were people who were fascinated by the sight of men going at a wall on the side of the road with spraycans so they stopped and starred and did what millenians do best: took selfies of themselves using the walls as a backdrop. Wane and a few other artists looked unaffected, just another day on the job, I guess. He said something really interesting about why he feels it’s a good thing that graffiti is more popular now than it was when he started decades ago. He said that besides making some artists – Banksy and Shepard Fairey come to mind – very popular, it has also made it easier for a lot of old graffiti artists to get back into the game. He said that in the past people did graffiti in their youth before moving on with their lives and getting married or getting into other careers. He has been painting graffiti all over the world having travelled – through his art – to places like Sweden, Holland, Japan, Paris, Germany and Australia. He said that any city that has some grittiness to it is a favourite for him.